Since cryptocurrencies are more or less unregulated there are a lot more opportunities to take advantage of unsuspecting traders. One platform that’s been heavily targeted by these scammers is Facebook. Facebook makes it really easy to run ads on their platform and even easier to get it in front of a large audience. What Did These Ads Look Like? The ads that triggered Facebook’s recent ban came in many different shapes and sizes. One of the most common types of cryptocurrency scams is an ICO. An ICO stands for initial coin offering and is a way for a cryptocurrency company to raise funds by selling off a certain amount of their tokens. These ICOs are popular because they give an opportunity to “get in early”. In the crypto world this means you can make a ton of money. The problem is many of these ICOs are fake. Individuals will put up a website and promote a digital currency with no intention of actually developing the product. Once the funds are raised, they’ll take the money and disappear into the abyss of the internet. Since millions can be raised through an ICO it’s worth it for these fraudsters to spend tens of thousands on Facebook ads promoting their products. Long story short, any ad that has any whiff of cryptocurrency in it will no longer be allowed on the platform. The main point here is that Facebook is merely trying to better understand these technologies so they can ultimately create a safe experience for their users. In order to do so the ban needs to be intentionally broad so they can gain total control. Rob Leathern, Facebook’s product management director said “We will revisit this policy and how we enforce it as our signals improve”. Facebook has been and remains the undisputed king of the social network market. Granted, in some regions of the world, like Russia or China for example, there is a more level playing field with the success of popular alternatives to Facebook who take an equal market share. But for the most part, Facebook is the worldwide leader when it comes to social interaction online. If you’re using the platform, you’ve got no choice but to accept the network’s settings on privacy and data protection and live with them. If you don’t want to do this, then you’ll have to find a good alternative to Facebook – and either convince all of your friends, family, colleagues, and acquaintances to join you, or be prepared for the fact that your online friendship circle will be significantly reduced (to begin with at least). Are you on the hunt for a good Facebook alternative? While it may seem like a daunting task, you can rest assured you’re not alone. Whether it’s because of hidden AGBs, data protection issues, or platform rules and regulations – the reasons for finding an alternative to Facebook are common and more and more users are looking to avoid the Californian social media giant. The market for similar networks is massive, and there’s a large selection of platforms ready to accept Facebook’s digital refugees. In our guide, we’ve already introduced some of the biggest and most important social media platforms around. But regardless of whether you’re using Twitter, Instagram, or Google+: Awareness and consideration about privacy and data protection are also important factors in choosing to use any of the other social media giants. One common complaint targeted specifically at Facebook is that that Facebook Newsfeed algorithms decide exactly what you do and don’t see. Another problem is personalized advertising, which is of course only possible through accessing and interpreting personal user data. As you can see: the list of criticisms for the social network market leader is long. So it’s good news that there are a few other alternatives to Facebook on the market. Some of these Facebook alternatives offer less advertising, others offer improved data protection, and some even offer extended functions and features that aren’t currently available for Facebook customers. The platform Diaspora is a social world online that puts your data back in your own hands, according to its own slogan. Its range of functions is similar to those of Facebook. Users can publish status updates, share posts and images, and comment on other people’s posts. And just like on Facebook, you can control who gets to see your own posts as well. Diaspora uses hashtags to order posts, meaning that you can use these to find like-minded people who share your interests. Linking Diaspora to your Facebook profile is also possible, and the software has its own chat function. 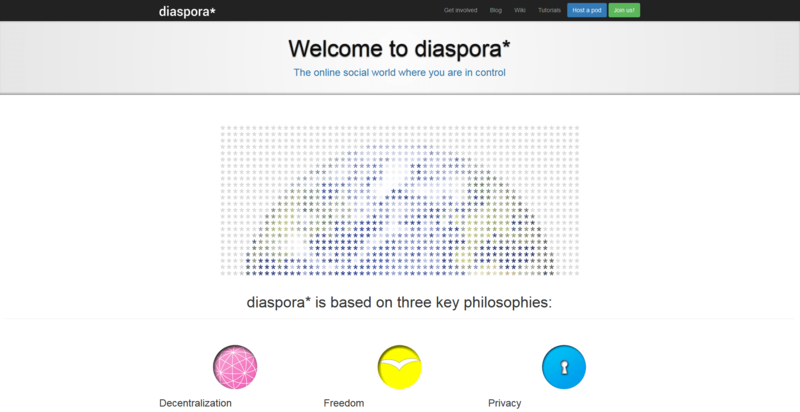 Diaspora is also an open source project. One of the main features that Diaspora prides itself on is its decentralization. This is to do with its technical background: the platform consists of many different networks, known as pods. User data isn’t collected and stored centrally by the provider, instead the infrastructure is distributed by users themselves, with data carried by these so-called pods. If you have good technical know-how, you can actually operate your own pod, which essentially functions as a server. This means that you can be certain that your private data remains private and in your own hands. Less technically gifted users can use ‘open pods’ in the network instead. With a little over 60,000 new users joining in the past 6 months, Diaspora is certainly only a very small drop in the ocean compared to Facebook. But its decentralized system and the control over your own data that comes with it makes Diaspora a definite option for users concerned about data protection. Lastly, Diaspora is completely ad-free. Since its founding in 2012, the operators of Ello have taken on a challenging task: they want to establish Ello as the leading, ad-free alternative to Facebook and other social platforms. This means that they’ll avoid personalized advertising at all costs. With Ello, there’s absolutely no forwarding of user data for advertising purposes and that isn’t likely to change. The platform is financed by a freemium model that involves the exchange of individual functions for small payments. There’s no official data about the number of users currently on the Ello network, but various sources range from 1.5 million to 4 million registered users, although the number of active users is assumed to be relatively low. When it comes to searching for additional sources of income to finance the project, Ello’s creators are rather creative: they have plans to begin generating revenue through user transactions carried out on their network – so by taking a commission on CD sales, for example. One of Ello’s principles is that its users aren’t obliged to use their real names, which had previously been the case at Facebook and caused outrage. When it first started out, Ello was a closed network, only accessible through an invitation to join from a registered user. This has since been relaxed, and today Ello is available for all interested parties. Critics of the site claim that Ello can’t really be considered a true Facebook alternative because it’s lacking many of the basic functions required to compete. For example, private communication between users via a chat box function is currently not possible. Ello’s focus instead is on high-quality content for all to see, making it an excellent environment for artists and photographers. Users from creative backgrounds are often attracted by Ello’s simple, minimalistic design, leaving lots of space for user posts to shine. The photo application from EyeEm, a startup based in Berlin, is less of a direct Facebook alternative. But its clear focus on images makes it a definite alternative to Facebook-owned Instagram and other networks that feature a lot of visual content. The photo app is available for iOS and Android and can also be accessed via your browser. According to sources at the company, the app currently has around 18 million users (Figures accurate as of June 2016). The platform is growing, collecting big investments and extending its functions and features on a regular basis. Its basic idea is the same as Instagram’s: EyeEm is a platform made for sharing photos. Snapshots and professional images can be uploaded and then shared with the community on EyeEm and other linked networks – with a range of different filters and editing tools to add that extra star quality. One feature that’s specific to the business model for EyeEm is that users can offer their own photos voluntarily on the startup’s marketplace. EyeEm sells these images with stock licenses to Getty Images and other purchasers. Users then receive a share of the revenue generated. This means that EyeEm isn’t just a platform for displaying images – you can make money from them too. And it’s not just an incentive for the user to post as high-quality photographic content as possible: the social network itself requires this in order to finance its business through advertising. As a Berlin startup, EyeEm has to follow German data protection laws, which are stricter than those in the USA. And the user-friendly presentation of data protection information on the network has also received great praise: Users have access to the full terms and conditions of the data uploaded to the site and how it will/won’t be used, but they also receive a simple, comprehensible summary of this. Path is a good Facebook alternative for users who care less about a large community and instead place far more value on having a selective friendship group to keep in contact with. At first, the number of friends per profile on the platform was actually limited to 150 contacts (though this has since been lifted). The app is available for iOSand Android. Path works via a form of freemium model: users can unlock different filters and stickers on Path Premium for a small fee. According to sources, Path has around 30 million users, the majority of whom are from Indonesia. In the last year, Path was taken over by Daum Kakao, and the company now operates many of its features, including its leading messaging service, from South Korea. InvestFeed – the first social investment network! Originally, the platform was only supposed to feature US Equities, but the team behind InvestFeed soon realized the enormous potential of the cryptocurrency markets.Now, the investment platform combines social media features with cryptocurrency data and price development details. InvestFeed aims to be a social platform for (cryptocurrency) traders. You can post stock recommendations and share your opinions and strategies with other investors (whom you can also direct message). This means that users can view, share and even duplicate the moves of other traders – in real-time! If you have a particularly good trading strategy, you can even earn money by publishing your stock recommendations and have other people follow them. This revolutionizes the market because people no longer need to dig through articles or forums to find investment advice.They also don’t need to pay for brokers or advisors – they can simply follow other users on InvestFeed and copy their moves if they think someone has a good intuition. Users will be able to see the performance records of all traders and investors they follow, and can even communicate with them directly via liking and commenting under their posts, or direct messaging them. The Scrypto.io project is a modern and convenient instrument for information exchange on cryptocurrencies both for newcomers and experts. The social network platform provides quick access to necessary information about cryptocurrencies, eliminating unnecessary search interactions. The system supports dozens of useful tools, except wiki-storage to serve the cryptocurrency community by making it easier for them to access and share information. Both experienced, and newbie investors in cryptocurrencies are faced with a common problem – waste of time while searching for necessary information on forums, maintenance of dozens of accounts on different resources dedicated to various altcoins. The whole task of flipping through hundreds of messages on one particular topic, sifting through all the important milestones in the life of a new cryptocurrency can turn out to be a highly unproductive exercise. 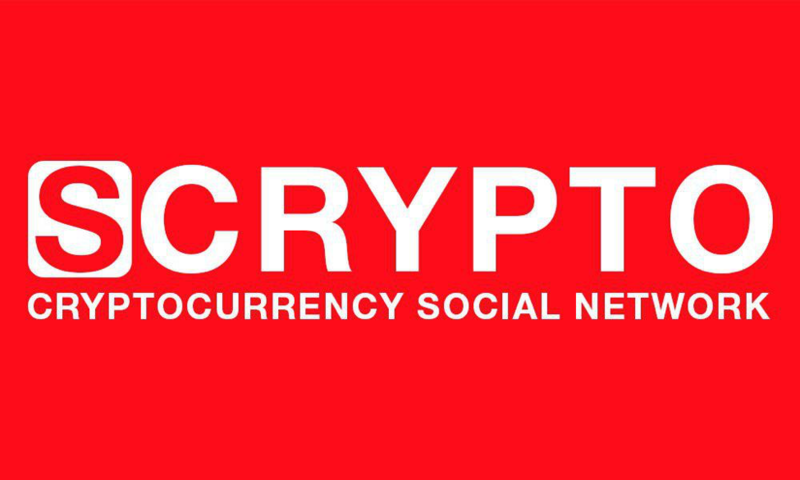 Scrypto.io implements modern social network tools into cryptocurrency theme to enable search, information maintenance, coins exchange, and even development. The platform is a combination of the popular “Wiki” mechanism along with video and graphics support, groups and quick user notifications. The Scrypto.io platform allows users to customize their accounts by setting notifications and alerts for important developments and issues. All these features put together, drastically speeds up the search and information exchange process. Scrypto.io breaks the entry barrier into cryptocurrencies for newcomers who do not have skills to investigate dozens of forums on obsolete engines. The social cryptocurrency network allows any internet user to quickly find the necessary data on particular altcoins in the wiki-storage, saving them a lot of time otherwise spent searching all over the internet. In Xenzuu is a kind of Facebook making money, were at the many points that are not gone so well for Tixuma improved. For example it is no longer absolutely necessary to recruit new members, as new users are automatically hooked into the User matrix without a sponsor and be automatically filled by the spillover effect with users. Referring new users is no longer necessary, but bring a faster growth of its downline and additional (!) Commissions on the Matching Bonus. With our new system, it is to be of advantage from the start because the downline will build quickly at the beginning. Currently an application is only possible with “coupon code”, which you must specify when registering. After signing up you can find in the back office area Your voucher code which you can pass on to interested parties. You might have like to be there already in the beta period and you look before, or invite some of your friends and business partners to do so. Cryptocurrency Scams & Phishing Warning: How Do Phishing Scams Work?